I don’t know about you, but I’ve had a handful of conversations with friends who have described the energy of the past week as overwhelming, rollercoaster-y, and unnerving. Beyond the obvious indicators of upheaval and strife that are hitting the news headlines every.single.day (I know...it’s exhausting and deeply frustrating), there’s a greater energy at play as we move into the later days of autumn here in the northern hemisphere. Traditionally, this was the time of the final harvest—a race to get everything done before winter’s frost comes. It was about gathering everything from the fields and gardens, drying, preserving, pickling, canning, and filling the pantry to the brim. All of this was imperative to surviving winter until spring came ‘round again. This was a season of hard work and transition—requiring you to be aware of your energy during a time of year when energy wants to conserve. It’s important to stash some away alongside your food and candles and firewood. Because, if you run yourself ragged, you’ll crash hard into winter. And in modern day, that means getting sick over the holidays, being grumpy at parties, and numbing out on food and alcohol. It makes sense that you may be feeling a little overwhelmed and rushed right now. My invitation to you is to channel that hectic, crazy energy into your hands by creating. Bust out your mason jars and get to pickling and preserving, or grab your knitting needles and get started on a scarf, or bust out the elderberries and rosehips and make yourself an immune supporting syrup. It’s ancestrally and seasonally aligned to be making right now. 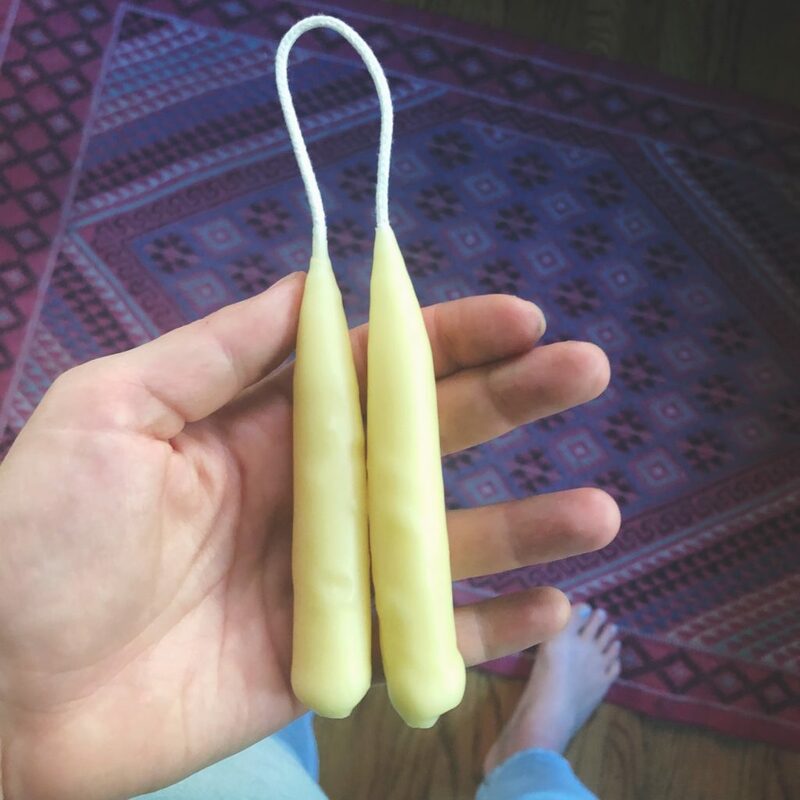 The other night, I couldn’t deny an urge to make some beeswax dipped candles. I’ve been thinking a lot about how my ancestors felt during this increasingly darker days and realizing how important it was to make candles this time of year. The process isn’t quick, but if I allow myself to slow down and get into a meditative state (with tea and good music), the joy floods in. I plan on dipping them all autumn long and giving them as holiday gifts in my famous solstice gift baskets. If you want to join me in candle dipping, there are plenty of tutorials out there on the ‘net and Pinterest. I have a bunch of beeswax (that I got from a local beekeeper at my farmer’s market) that I melted in a double boiler over the stove. Then I cut woven candle wick (like this one) in 12-inch pieces and tied washers to the bottom of each end to weigh them down. 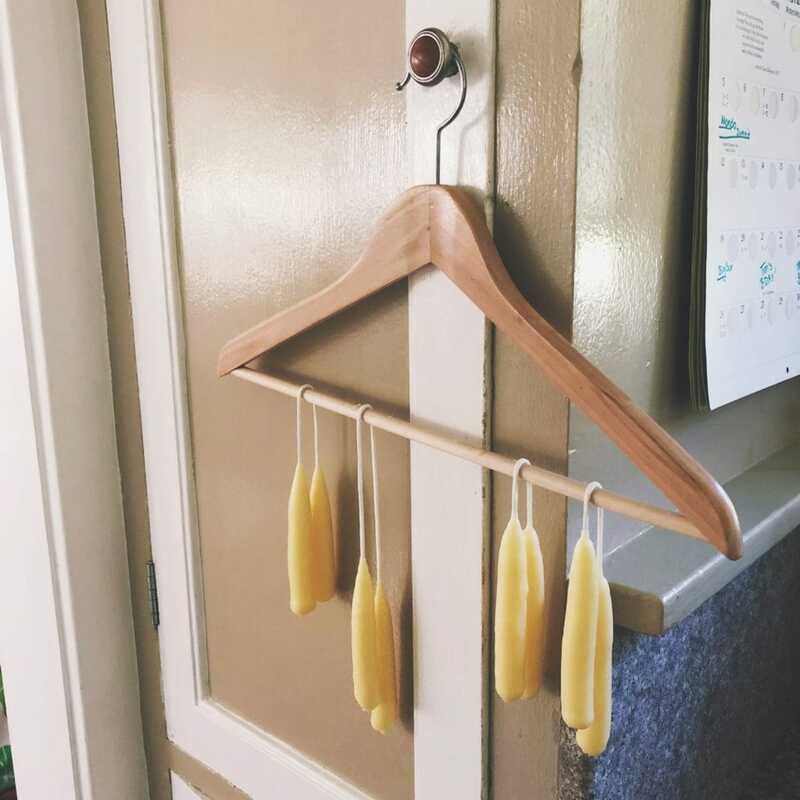 I dip each of them in the melted wax and then in a pot of cold water and hang them on a clothes hanger to cool a bit before dipping it again to add a layer (if you dip too fast, it’ll melt the previous layer and then you won’t get anywhere). After a few dips and it feels straight enough, I cut off the washer at the bottom and use my hand to mold the warm wax into a rounded end. Magic Tip: As you’re dipping the candles in the wax, infuse intentions and blessings with each dip. Thinking about what this candle represents and how it’s energy will permeate the space where it will be lit. I was thinking about being the light in the dark—casting shadows and finding beauty in the mysteries. May all who come in contact with these candles feel the ancestral curiosity that brought me to making them. What are you making this autumn? How are you feeling right now and what are you doing to ease into these darker days? What have you harvested? I start canning in the summer, fruits and jams. This year I went a little crazy with cherry marmalade among others. Early fall is tomatoes, and by nowI’m almost out of steam, but I still have apples to go into apple pie filling and applesauce. And i need to get back to the baby blankets I started before the grand baby is too big to use it! Plus I work so i can relate to the burnout part. 🙂 Good blog, happy fall!! Oh Barbs, you’ve been busy and in the best possible way. Yes yes it’s time to start slowing down, and apple pie sounds like the perfect companion for that. Happy making! Good Morning, love your candles one of my favorite ways to make candles, there is something so relaxing in making them. Right now I am in the process of finishing up 4 bushels of apples, have made apple butter, applesauce, apple pie filling ( need to make two more big batches of this), just emptied the dehydrator of apple slices. Tomato’s are done, green beans are done, many veggies dehydrated. Still have to gather up various types of nuts before the squirrels get them all. Still have to gather the last of the herbal roots. There is nothing better than looking at all of our hard work in the winter and saying “yes I did that”, knowing you can feed your family good wholesome food makes it all worth while. Hey everyone! Where’s the best place to buy beeswax? First option is to buy it locally from a beekeeper. Next option is to go online. You can find beeswax pellets on amazon.com, herbiary.com, and mountainroseherbs.com – among others! I have been making essential oil infused body butters, lip balm and bath bombs! I plan to give some for holiday gifts. Hi there! I just found your blog through a sponsored fb post and I’m SO glad I did! I so love the changing of seasons and this cozy time of year. I have been making herbal teas lately using various herbs that are good for supporting respiration (ie. echinachea, turmeric, lavender, mullein, marshmallow root, and chamomile). I’m also preparing to make a bunch of Fire Cider for holiday gifts. And now after reading about your candles and my fond memories of making them at Girl Scout camp, I would love to make these too. Do you know of any natural dyes to use in candle-making? Your teas sound infused with so much love and medicinal herb magic. And fire cider – yesssss, best handmade holiday gift.